This homemade peanut butter recipe is a snap to make at home with just a few simple ingredients. No unnecessary additives here! To me, there is nothing more comforting than peanut butter and jelly sandwiches for lunch. But if you’ve been riding on the real food train and are an avid label reader, you know that the ingredients to make a peanut butter and jelly sandwiches can be far from healthy. Hydrogenated oils, high fructose corn syrup, random genetically modified ingredients, food coloring, and preservatives are just a few ingredients that are often hiding in the peanut butter, the jelly, AND the bread. 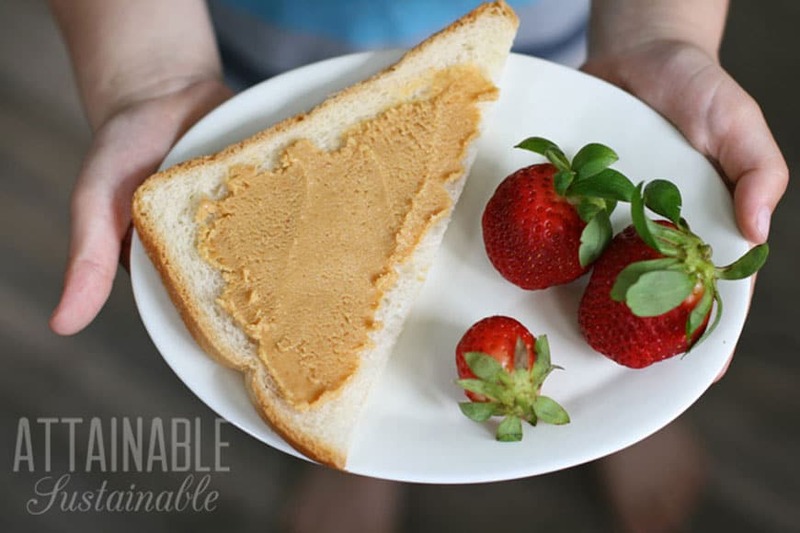 Those three simple components of a peanut butter jelly sandwich can be made at home for a healthier version and it’s really not hard to do. Homemade bread is really simple to make. It sounds a bit scary, and I was definitely intimidated the first time I made it, but I was pleasantly surprised at how easy it was. I typically either make a loaf of bread with einkorn flour because it’s my favorite to use (here’s why) or a really simple white sandwich bread recipe from my friend Tara (found below). If you want more information on yeast breads versus quick breads, check out this post. Also, if you’re taking the time to make homemade bread, don’t forget the linen wrap to keep it fresh and reduce the use of plastic in your home. 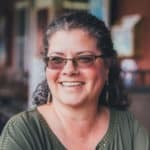 If you’re buying store-bought jelly, you want to make sure to read the label and look for any “red flag” ingredients: sugar (this often comes from genetically modified sugar beets), high fructose corn syrup, fructose, and any other ingredient that does not resemble an actual food product. The problem with most store-bought peanut butter is that it contains industrialized and often times hydrogenated oils. Amazingly, companies can also sneak in some processed sugar or high fructose corn syrup, which you want to avoid when making a healthier peanut butter and jelly sandwich. 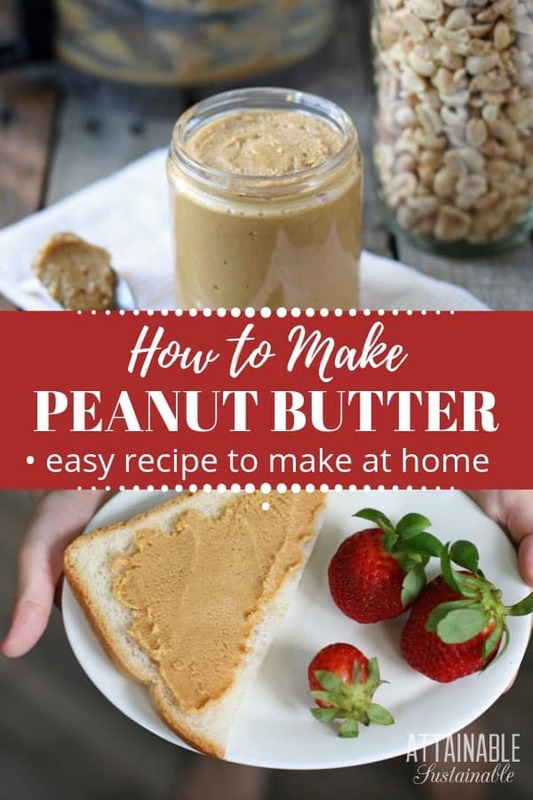 Making this homemade peanut butter recipe is really simple and you can customize the ingredients to your taste. For instance, if you like sweetened peanut butter, you can add honey. Or you can totally omit a sweetener. All you really need is a high powered blender or a food processor to grind the peanuts. For oils, you can either use a refined coconut oil or a sustainably sourced palm oil. One thing to note: This homemade peanut butter recipe will result in a spread that’s a little more gritty than store-bought peanut butter. A high-powered blender like a Blendtec or Vitamix, it’ll get you closer to that super smooth peanut buttery goodness you’re used to. 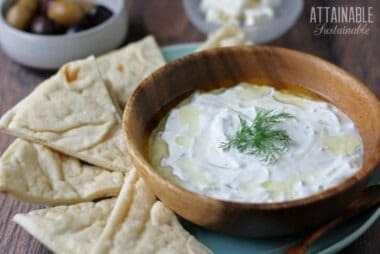 Either way, this homemade version is wholesome, spreadable, and oh-so-delicious with homemade bread and homemade jelly. 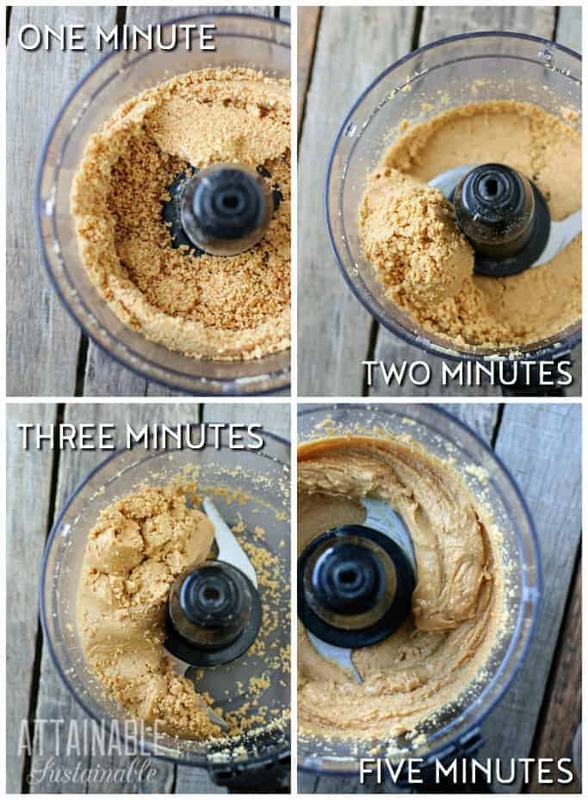 Put two cups of peanuts in a food processor or blender and blend on high for one minute. Your peanut butter will look dry, it's okay. 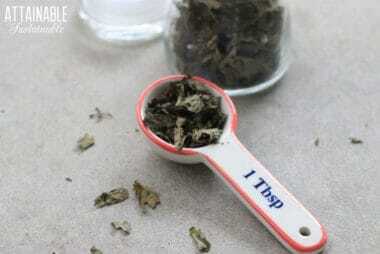 Scrape it down from the sides, and blend again for one minute on high. Scrape it down from the sides, and blend it one more time for a minute on high. You may have to stop at some point before the time is done to scrape more down near the blade. Your peanut butter is almost there! Give it another whirl for a minute (so now we're at 3 minutes). At this point, you're close to the creaminess you love. Scrape down the peanuts and add in the rest of your ingredients (melted coconut oil, honey, and salt). Blend for 3-4 minutes. Transfer to a jar, cover, and place in the refrigerator. Peanut butter is good for several weeks, although it goes rather quickly in our home.